The beautiful home sites at Frederica are carefully designed – we want our home owners to have a spectacular view from every vantage point. We accomplish that by working hand-in-hand with nature, laying out home sites to harmoniously fit into the maritime forest of mature trees, palmettos and other plants native to coastal Georgia. 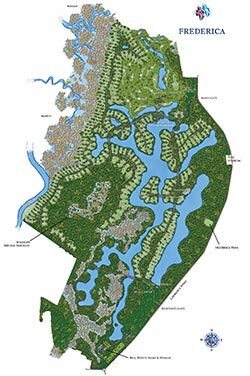 Home sites are available in all of Frederica’s unique settings: Golf course, lakefront, riverfront, marshfront and the Rookery. Regardless of your choice, you will be surrounded by an environment that is ready to share its inherent beauty. Peruse our offerings below or click to view our Interactive Map. Come for a visit, explore and see for yourself why Frederica is unique among other coastal Georgia real estate options.